WOW you guests with the Pebble Sphere Fountain. This artistic sphere has an intricate pebble stone finish which lends the appeal of fine stone design and architecture. 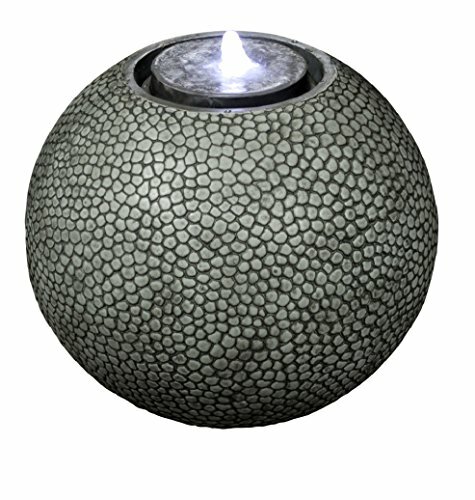 The LED lighted water produces an even greater decorative appeal to this unique sphere. The dancing lighted water will enhance a calm and rejuvenating atmosphere in your outdoor environment. Included is a quiet, powerful, adjustable-flow submersible water pump, combined with the cool LEDs, that plugs into any regular single electrical outlet. Simply attach the easy-to-set up pump, fill the basin with water and plug it in to enjoy the serenity of cascading waterfalls.